Sometimes all it takes is a fresh perspective to improve your garden. 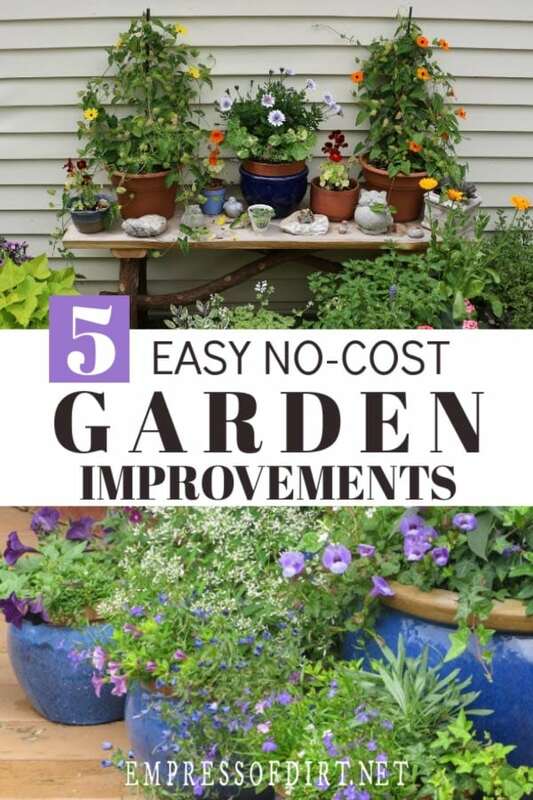 Grab these tips for making the best what you have for a better garden—without spending a dime. 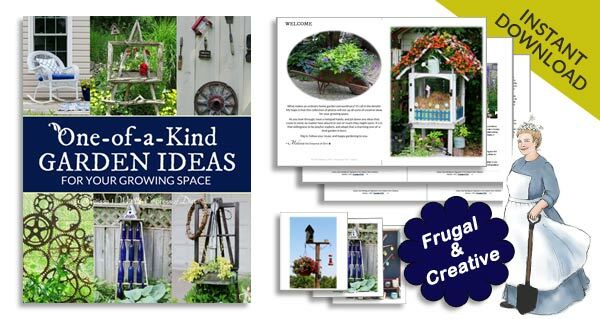 For more, also see the Ideas section for creative ideas from home gardens. 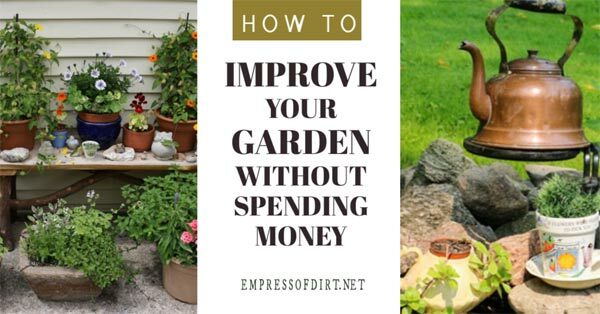 Would you like to give your garden a fresh new look without spending money? Often, we already have what we need, and all it takes is a little elbow grease and rearranging to give an outdoor space a whole new look and feel. I’ll walk you through some of my favorite tips. If you have some to share, please let me know in the comments. 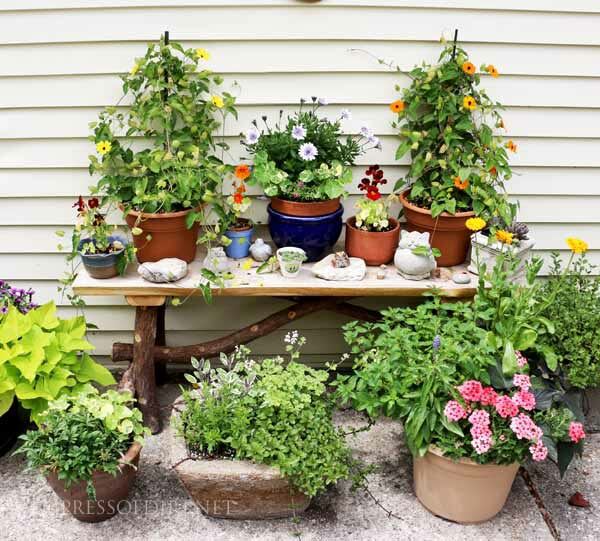 Most of us have limited resources to fill a garden with as many plants as we would like, so the temptation is to spread the ones we have throughout the garden, adding dashes of color here and there. But what if you brought all those flower pots together to create one big, bold burst of beauty? Pick a location where you will enjoy them the most, perhaps by a patio or entry way. Add some bricks, crates, or a table to allow various heights and give the illusion of abundance. Add some garden art or decorative items from storage and now you have a fabulous focal point in your garden. For many of us, summers are way too short, time flies by, and before we know it, the cool autumn weather sneaks in. 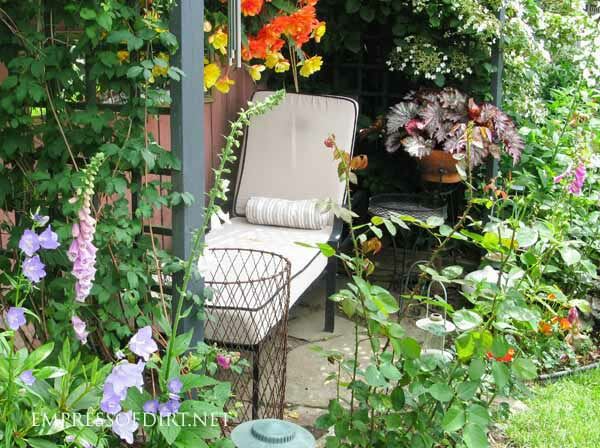 My remedy for this is to have a garden nook all set up so that, no matter how little time is available, I can settle right in and enjoy the garden. Pick a shady location, your most comfortable chair, and have essential supplies handy in a bin nearby. For me, that means a pillow, throw blanket, and books and magazines I never seem to have time to indulge in. Grab a cool drink and take time to relax. Love a summer evening outdoors? Hang up some outdoor holiday lights and gently light up the space. 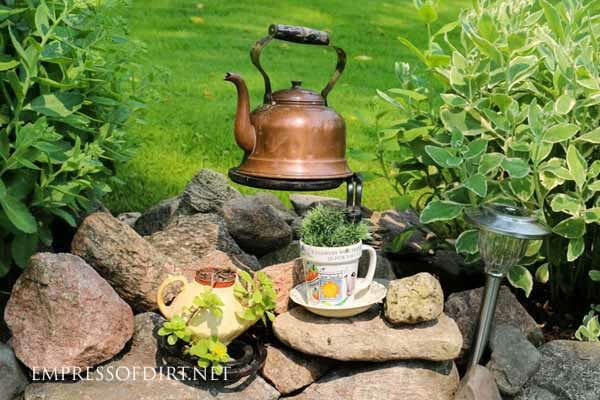 Whether it is watering cans, old kettles and tea cups, or clay pots, often we already have a collection of items that are perfect for display outdoors as quirky garden art. 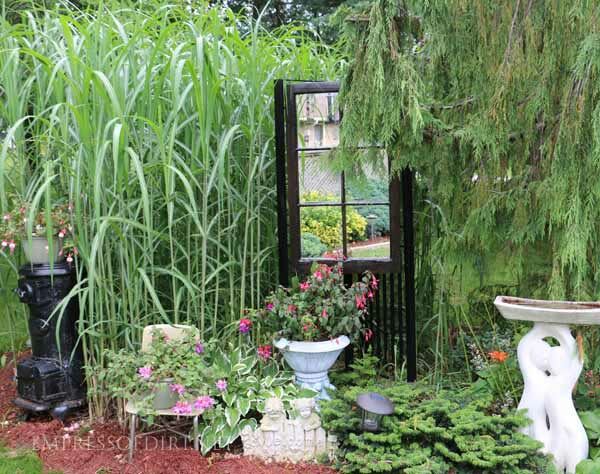 See what you have stashed away, pick a theme, and get creative with your own garden vignette. I saw this tea-themed arrangement on a garden tour and thought it was quite charming. 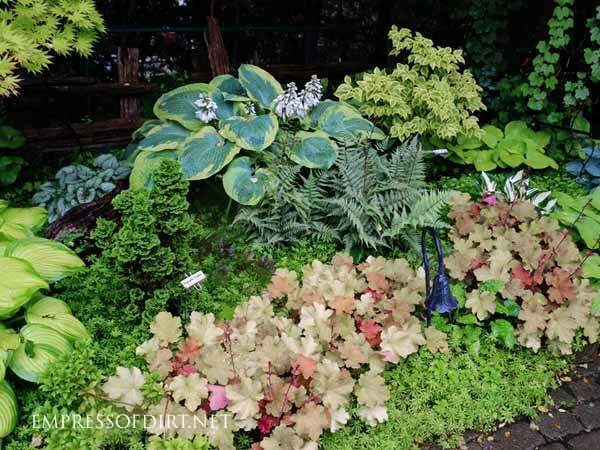 This is my number one tip for making the best use of your existing garden plants: work with contrasting colors. Some of the most beautiful plants can get lost in a garden, virtually unnoticed, if the ones next to them are too similar or distracting. Examine your garden beds and see which plants deserve a better location so they can really steal the show. 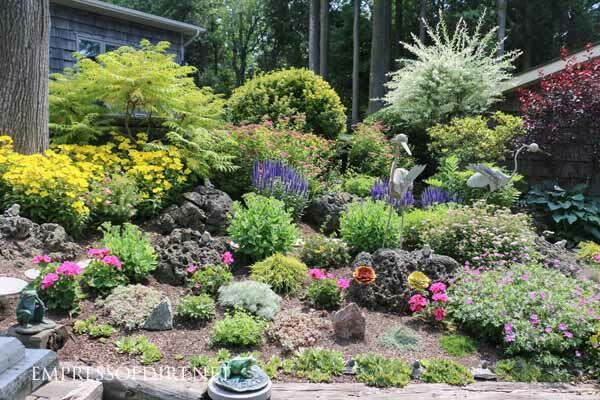 Think about ways the various colors and textures can play off each other and try shuffling a few plants around. Just like rearranging the furniture in the house, you might just come up with something fabulous. 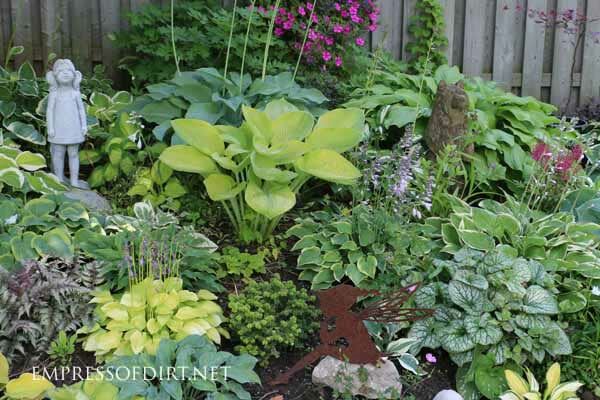 In this next photo, the hostas, ferns, heucheras, and succulents all play off each other. I saved this one for last, but it is really the most basic and effective step for dressing up a garden without any expense: weed, trim, mow, and edge. There is nothing like crisp edges (created with a nice, sharp edging tool—I use a serrated kitchen knife!) and weed-free beds to give a garden a fresh, new look. Add a layer of organic mulch to bare surfaces, and you will buy yourself more time before you need to do it again. When my garden has the blahs, I always do this first. Then, once the debris is removed, I start changing up the garden art and moving a few plants around if it still needs something more. It is amazing what a difference good garden grooming makes and, best of all, it does not cost a thing. 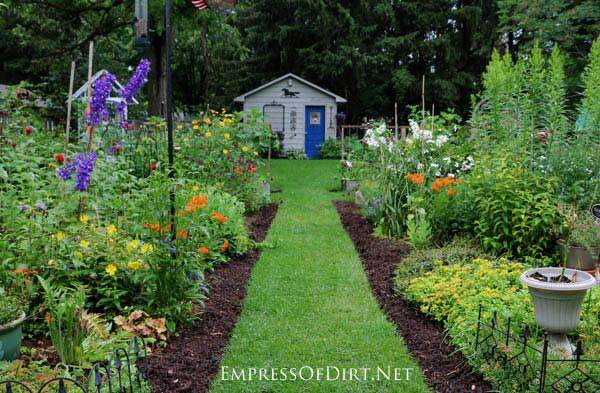 10 Garden Mistakes that Waste Money | Ever wish you could have a do-over? I do! Find out the mistakes I made so you can avoid them. I really enjoyed your post. Creative and shall i say pushing, : ) I have begun to rethink my garden spaces. thank you. Yes I agree ..keeping your flower beds always manicured makes for a lively sight. It takes some work but the results look fabulous Sone great ideas here. ?